Get ready for it today! Usually I will post my mega reviews of a new product on my blog first but in this case I have so many polishes that are so irresistible that I felt I had to at least do a quick mani for these pretty babies. Plus two of my nails popped off so... Yup I got the new Colors by Llarowe stamping polishes that will be releasing on the 19th of March for preorder. 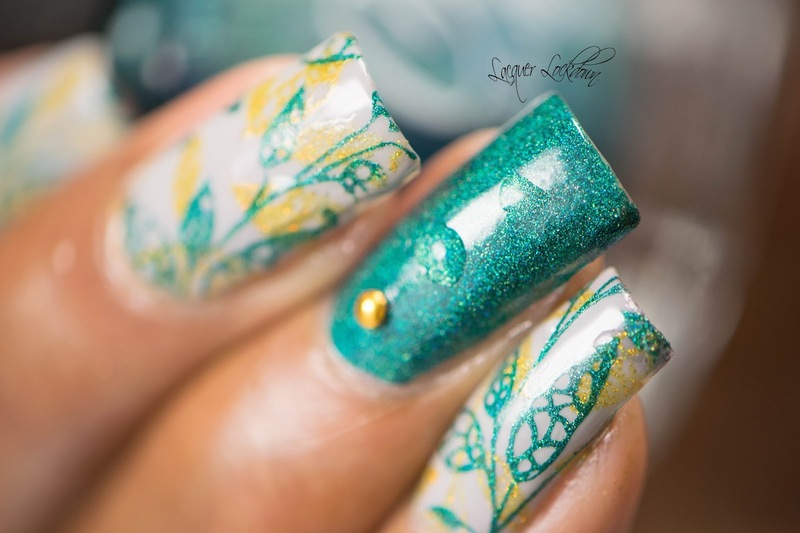 These polishes are beautiful and double up a regular polishes too. I can't wait to share them all with you, but for now here's a taste of what's to come. My fingers are wet through so many of these photos you will have to excuse me. The thermal I used here from Dance Legend was not very sensitive so I had to keep wetting my nails to show the transition. 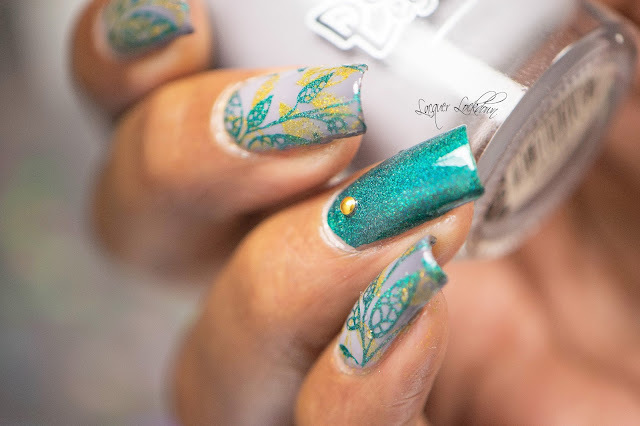 So a little about these polishes and this plate before the big review. For the most part all of the polishes are holographic and stunning. They can all be worn as regular polishes as I did so here. I'll get into that more in the review, but yeah. As you can see they are quite bold. 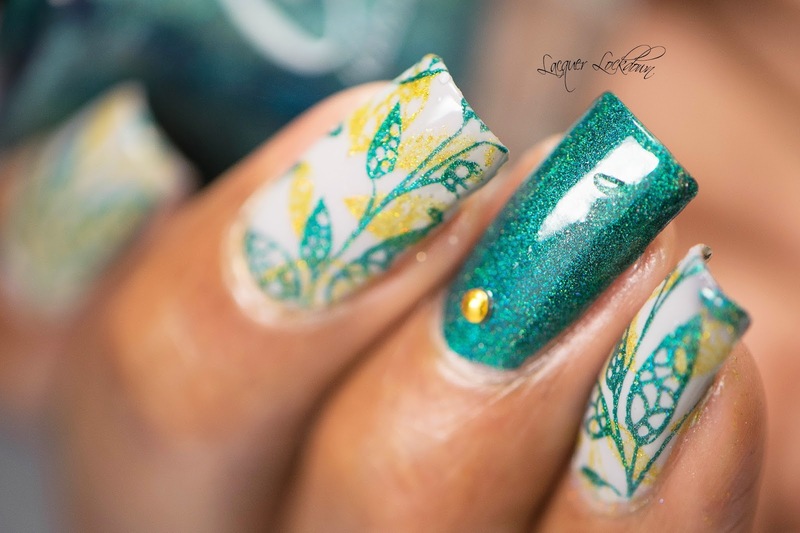 I actually did two versions of the this mani but I wasn't as pleased with the first one so the whole thing got a reboot. The LeaLac plate is actually also from Llarowe. During the days that she first created her own plates and not from when they got redone to smaller sizes. As such I have the original plates in the original super large image sizes. These are not for the faint of heart, but there are a lot of beautiful images on these plates which is why they got redone as you can imagine. 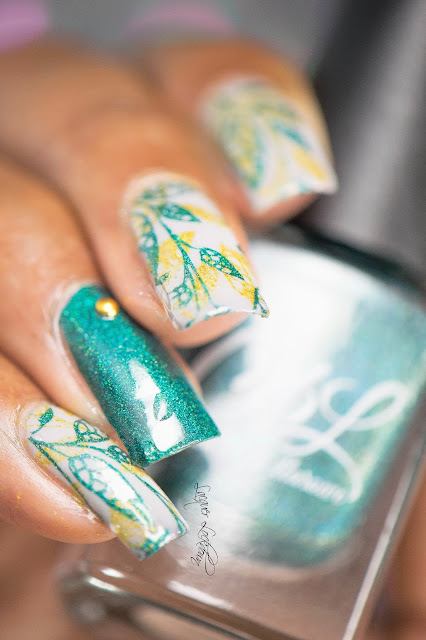 Those are also no longer in production, but I thought for the first art I created using these polishes wouldn't it be fun to also use the plates made by the same creator. 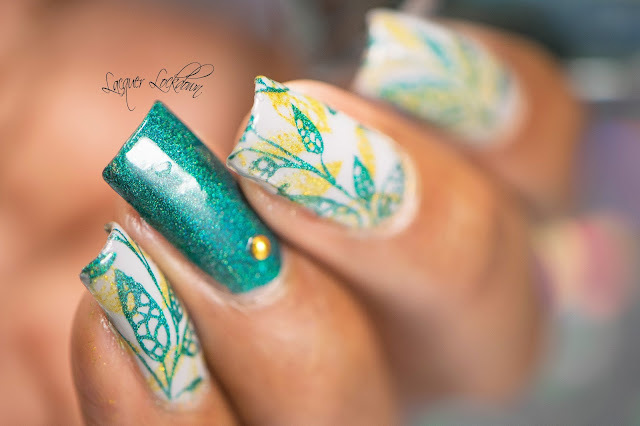 If you want to create a similar look I have leaf plates from a variety of other companies - Pet'la, Messy Mansion, Moyra, and even Born Pretty so you can definitely recreate this look! Now this thermal from Dance Legend seriously frustrated me to death. First of all it did not transition through the 3 shades and it was so hard to get it to change color. That's the first time that's ever happened to me before with a thermal. I think its because the way I have changed my set up the lights that I have get so hot and are huge. I noticed when I was outside it was transitioning away :/ The formula on this one must be a bit more finicky than some of my other thermals that just go at a drop of a hat. Go figure *rolls eyes heavenward*. Obviously here I could barely get an edge to transition and it was so brief - gah! So I'll leave it there - I started to make a really stupid pun but I left it alone. Rofl!! For those who know where I was headed thank you for your silent laughter ;) So what do you think? I love how this came out thermal transition or not. The way these two colors are playing together are something else. Golden rule in particular is the kind of polish I haven't ever seen before let alone for stamping. It really brought an added element of special to this whole affair. The CbL stamping polishes will be available for preorder on March 19th. You can find them here. Stay tuned for the full fledged bowl you over with details review. Happy hunting and I'll see you next post! This post contains items purchased by me and polishes sent for my honest review. For more information see my Disclosures Policy.